Wikipedia has an article on Nintendo 3DS. Nintendo Wiki has an article on Nintendo 3DS. Bulbapedia has an article on Nintendo 3DS. Dragon Quest Wiki has an article on Nintendo 3DS. Fire Emblem Wiki has an article on Nintendo 3DS. Golden Sun Universe has an article on Nintendo 3DS. Icaruspedia has an article on Nintendo 3DS. Lylat Wiki has an article on Nintendo 3DS. Metroid Wiki has an article on Nintendo 3DS. Nookipedia has an article on Nintendo 3DS. StrategyWiki has an article on Nintendo 3DS. Super Mario Wiki has an article on Nintendo 3DS. WiKirby has an article on Nintendo 3DS. Zelda Wiki has an article on Nintendo 3DS. The Nintendo 3DS is a handheld video game console released by Nintendo. The console is the direct successor to the Nintendo DS. It is competing in the eighth generation of video game consoles alongside the PlayStation Vita. The console is slightly less powerful than the Wii, and has an autostereoscopic 3D screen which allows a player to see an alterable level of 3D without the need to wear glasses. It also features a gyroscope, an accelerometer, and a touchscreen. The 3DS also features a wireless mode, active even in sleep mode, that renders it able to passively share information with other nearby 3DS systems, known as StreetPass. 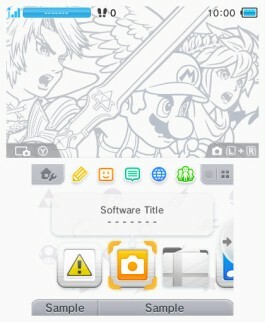 A mode similar to StreetPass, SpotPass also allows the 3DS to download data from the internet when the 3DS comes in range with a Wi-Fi hotspot. While moving, the built-in pedometer also allows the user to earn Play Coins. One Play Coin is earned for every 100 steps walked. The 3DS is fully backwards-compatible with the DS, though it lacks a Game Boy Advance port that some DS games use. The built-in online shopping software Nintendo eShop, however, allows for the download of NES, Game Boy, Game Boy Color, and other third party handheld console games. Game Boy Advance games have also been offered on the eShop via promotion. Nintendo first spoke of the console prior to the 2010 E3 press conference, and Nintendo released the system in Japan on February 26, 2011 and to North America in March 27, 2011. A second model of Nintendo 3DS, the Nintendo 3DS XL, was released on July 28th in Japan and Europe, and in North America on August 19th, boasting larger screens than the original Nintendo 3DS. A third variation of the 3DS, called Nintendo 2DS, was released in all regions except Japan on October 12, 2013. It is considered a reduced-cost Nintendo 3DS, with a flat design rather than a clamshell design; it also lacks the option for 3D visuals. In the Japan-exclusive Nintendo 3DS Direct on August 29, 2014, the fourth and fifth models (the New Nintendo 3DS and New Nintendo 3DS XL) were announced, released in Japan on October 11, 2014 and in Australia on November 21, 2014, with Europe and North American getting the handhelds on February 13, 2015. However, in North America, only the New Nintendo 3DS XL has been released. Both models have ZL and ZR buttons, a C-Stick, more powerful hardware, different positioning of some buttons, automatic brightness depending on surrounding light levels, and 3D visuals that can be seen from a wider range of angles. Custom faceplates are available for the New Nintendo 3DS, but not the XL version. The New 3DS also has built-in amiibo compatibility, whereas the original 3DS models require an adapter to interact with the figurines. A subsequent revision, the New Nintendo 2DS XL, would be released in 2017 worldwide, featuring a slimmer, streamlined design without the 3D visuals of previous varisnts. Super Smash Bros. for Nintendo 3DS was released for the 3DS, marking the first time in the series that a Super Smash Bros. game has been playable on a handheld system. 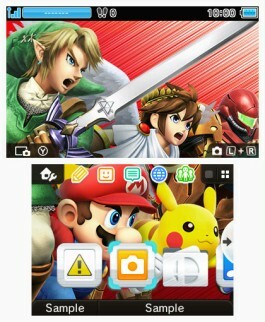 The Nintendo 3DS can also be used as a controller in Super Smash Bros. for Wii U by linking the two games; this is also possible without a copy of Super Smash Bros. for Nintendo 3DS by purchasing the Smash Controller application. A demo for the game was also released in Japan on September 9th, 2014, and special codes for an unlimited demo were sent out on September 12th, 2014. Full access to the demo outside of Japan was granted on September 19th, 2014. A special version of the Nintendo 3DS XL was also released that featured characters from Super Smash Bros. in poses similar to those of the Super Smash Bros. for Nintendo 3DS boxart. A similarly designed faceplate was also released for the standard size New Nintendo 3DS. The controls are customizable. These are the default controls. Note that the D-Pad cannot be customized, and can only be used to perform taunts. The New 3DS's C-Stick cannot be customized either and is used for Smash attacks. ZL and ZR have the same function as L and R, albeit reversed. 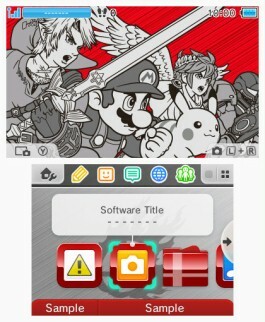 The Theme Shop on Nintendo 3DS systems allows for purchase of various home menu themes. 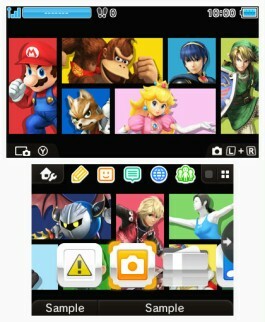 Four themes related to Super Smash Bros. 4 are available, each coming with appropriate music. The New Nintendo 3DS XL. The New Nintendo 2DS XL. The limited edition Super Smash Bros. Nintendo 3DS XL bundle packaging. The package and the limited edition Super Smash Bros. Nintendo 3DS XL design. The Super Smash Bros. faceplate for the New Nintendo 3DS. This page was last edited on December 17, 2018, at 13:13.